TRAVELLERS camped in the Meriden greenbelt have been given three extra weeks to leave the land due to bad weather. A MERIDEN man has been ordered to pay £646 compensation after pleading guilty to damaging the door of his estranged father’s former home. THE latest appeal by the Meriden gypsies to stay at the illegal Eaves Green Lane camp, has been thrown out. PROTESTERS against an illegal travellers site in Meriden woke to find toxic waste had been dumped by their camp last week. CONTROVERSIAL plans by the Meriden travellers to move their illegal site to agricultural land next door, are being recommended for refusal. The Gypsies had signed an agreement with Solihull Council to leave their Eaves Green Lane site by next March. 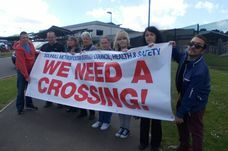 A GROUP of residents who set up camp after travellers moved on to greenbelt land marked 900 days of protest this week. POLICE are investigating after a protest camp against the Meriden travellers was vandalised in a late night attack. MERIDEN protesters have welcomed the council’s decision to block travellers from setting up a builder’s yard next to their camp. A planning application was lodged to change the field next to the Eaves Green Lane gypsy camp, from its official agricultural listing to a commercial builders yard. TWO hundred Meriden protesters have signed a petition condemning alleged anti-social behaviour at the Eaves Green Lane gypsy site. TRAVELLERS at an illegal camp in Meriden have had their latest plea to stay thrown out by the Court of Appeal. PROTESTERS have accused Solihull Council leaders of being “naive” after travellers lodged a further appeal to stay in Meriden. MERIDEN residents have renewed calls for traffic calming measures to be installed in Eaves Green Lane, following another collision on Saturday. MERIDEN villagers have pledged to continue their protest camp in Eaves Green Lane, despite being told to pack up and leave.